The New Year's Resolution that Matters. It’s been a great year at Infinity Farm. I’m thrilled to say no one died. It’s kind of a miracle–all ages and infirmities considered. I wandered through the memories of the year, looking for a stellar moment to share with you, one that was inspirational and would reflect the best of us. There were a pile to pick from, but in the end, it was a no-brainer. Instead of the chatter of New Year resolutions to diet, or train harder, or accomplish a goal that means more to you than it does your horse, take a cue from Hannah. Instead, make a more important resolution to your horse, and then do whatever is necessary to keep it. The ripple effect of good intention from doing that will take care of all the lesser resolutions. And now, can we talk about our relationship? This part is all about you. I appreciate you more than I can say. But let me try. When I started this in early 2010, each time I posted a blog, I also emailed my friends and reminded them to read it. I considered it a huge success if I had 20 hits over a week. Look back in the archives, the writing probably deserved even less. I’ve worked on that. This is where you came in. You heard about me somewhere–on Facebook or a horse site somewhere and then maybe you told a friend. Some of you shared my blogs with a group. Every once in a while a horse article got shared by a dog group. Some of you read the blog and don’t have a horse or a dog, but tell me it helps with kids and husbands–you open-mined humanists hold an especially special place here. This year I was gobsmacked. The WordPress folks tell me there were over 140,000 hits in 2014. Not counting the readers on other sites, and there are a fair number of those. And over 1100 of you follow my blog. Really? It amazes me. In light of all of this, a thank you sounds pretty trite but here goes–Thank You All Very Much. See? Even in bold and italics, it still isn’t near enough. Because I sit in a small room with a few dogs and cats, writing away in the early hours, and it gets quiet. Seeing a ‘like’ or getting a comment really matters on this end. You all inspire me, nothing less. It isn’t that it’s self-gratifying, (of course it is), but more than that, I get to be part of a group. And you all are a very cool group. Thank you. This year the comment-makers were especially wonderful. So heartfelt and kind to each other. It was like we are all friends who ride together…only in 155 different countries. Just the kind of barn family I’m proud to be a member of. Thank you. And finally, can we talk about me? I started this blog five years ago because I love to write as much as I love to ride. I love to explain something that’s hard to explain. I love trying to describe a feeling with such clarity that we all recognize part of it as our own. I want to find the words to describe horses through my eyes. I think at rock bottom, writing and riding are inspired by the same passion. They are both communicating with purpose. Then two years ago, I had a New Year resolution to start writing a book. The first year was writing, the second year was re-writing my way through three professional edits, and now I’m pleased that each of the 78,000 words are in the correct order. I’m done with the manuscript. The first reviews have been very positive. Now I have to get used to promoting it, not easy for me. The book is Stable Relation. It’s a memoir about a midlife crisis, a poisonous family secret, and moving to the flat, windy Colorado prairie to build a different kind of family farm. The publishing world changes every day and knowledgeable opinions contradict each other. It’s hard for an old gray mare to know what to do. I attend writer’s workshops on marketing and publishing, but I have a lot to learn and I notice I am allergic to places with no animal dander. Or maybe I have a personality disorder that is irritated by meetings in hotels. I do my best and take my own horse-advice about my book. Hold a high vision, keep breathing, and be grateful for small steps. It seems I am competing in a whole new arena, and I really hope you will help me get there. They tell me to roll out a new book website. It’s called Anna Blake, The Print Version. Check it out here and read my elevator line. (I learned about them in one of those hotel meeting rooms.) The book will have a Facebook page soon. So, after all you have done for me, I actually have the audacity to ask a favor. Another click or two, please. I could use the leg up. I wish us all grand adventures in the New Year. Everything will be fine. We will love him forever, and let the rest fall where it may. ← Want to Hear my Elevator Line? Nope, it was me. I think I fixed it…please try again. Or try http://www.annablake.com and again, thank you for helping me! I wanted you to know that the link isn’t working for me in this email. The first time I got a blank page that said “new tab”. The second time I got a page that said ERROR 522 on it. I’ve got to dash out to teach, so don’t have time for a third attempt…maybe it is just on my end…. Awk, thanks. I think I fixed it. Easy to get bucked off all this technology, but I climb right back on. You have an amazing talent for communication and empathy with your readers and enviable willpower to keep bringing us wonderful posts week after week, you deserve every success I’m sure 2015 will bring – a very Happy New Year, Anna, and a best-seller to you! Ah, thanks. I appreciate the good will. I really hope the book will be available in Germany. 🙂 Can you check out the link to your new site? It seems it doesn’t work – still. The link should work now… and I will be happy to get one to you. Just as soon as there is one bound. Thanks. I really appreciate the way you put your thoughts down in writing. Inspiring and thought provoking. Unfortunately that link still doesn’t work… Keep up the good work! A tech runaway. I’ll try again. and Thanks! We have a good friend, Jon Van Zyle who lives in Alaska. He is an artist and has decades of experience in the publishing business. If you want to contact thru Facebook, please tell him Kathy and Butch Hollister recommended you yo contact him. He might be able to shed some light on the publishing business for you. He and his wife Jona are wonderful people. No really, THANK YOU! Any publishing tips would be a huge help! i clicked, but it went to a screen that said, “this screen not available”. not only do you have to ride and write, but you have to be a computer genius! Right? It’s enough to make you want to go muck. Please try again, I might have managed it. Old friends are the best. Thanks. WordPress might be dogging me. Can’t seem to get the title up either… Working at it. Thank you so much for taking the time to do what you do. Coming from someone who hates to write I admire you for taking the time to do it and especially for the insight you provide. I can’t wait for your book. I imagine it will require a box of tissues to get through. I had a pretty awful year in 2014 and many of your posts really helped me. Onward to a better 2015. 2014 was a hard one, all right. Don’t mind leaving it in the dust. So many of my clients faced huge challenge. But we are a strong breed, we survive. Thanks for sticking it out. Onward is right. I am looking forward to reading the book, it certainly sounds intriguing . I sure hope it is a great success for you, you deserve it. Just FYI, I know you’re working on it, 8:56 PST, still getting a timeout, still offline, it says the homeimprovement.com is not working/up. Have enjoyed your writing for years, looking forward to the book! Thanks for sharing with all of us. And so sorry. It shouldn’t be this hard. Anna, I look forward to the email in my box each Friday telling me a new blog post is ready. You inspire me. I always come away with an idea or a thought to ponder which impacts me in a positive way. I can’t wait to read your book – going to the link right now. If it’s cranky I’ll keep trying. 2014 was tough. Here’s to a kinder 2015 for all of us. What exciting news about your book! I will definitely look forward to reading it. 2014 was also a tough year for me. I had beloved three animals euthanized (two “grandfather” horses exactly seven months apart and once cat in between), put the home that I loved up for sale and moved to across the country to Western Colorado due to my husband’s job change. While the new area I am living in has a lot to offer, things are not working out the way that I had hoped so I am contemplating yet another move as I enter into 2015. As other readers have mentioned, I too have found inspiration from many of your posts and have been touched by your thoughts and reflections as I struggled through 2014. I imagine your book and blog both will provide even more positive support to your readers in 2015. I plan to keep reading. Congratulations! Lousy year, Mary. I keep thinking that everything is change and even bad can’t last forever. Here’s to a better 2015. Thanks for reading. Hi Anna – Thank you for yet another wonderful post, which is, as usual, meaningful to me on several levels. First, because I reached a point last year where I no longer had the strength or will or whatever to impose my agenda on a horse that wasn’t enjoying the experience. It is very clear to me when my horses are happy with me, and equally clear when they’d really rather not — a sign that I have failed in the motivation department, and whereas before I might have bullied my way through, I just can’t do it any more. So Yay for Hannah. Secondly, I deeply understand your aversion to the self-promotion required by the publishing industry. I expect that you will find your way, and it may not be exactly the way of everyone else. You may get some inspiration form Amanda Palmer’s wacky new book, “The Art of Asking” – it helped me. Thank you for keeping at it. I look forward to reading more from you. Yes, I have a YA fiction series out, published by a small publishing house, so much of the promotion has been left to me, and I am not a natural at this end of the biz. The protagonist is a certified horse nut, but also has Turner Syndrome, so there has been more than one target audience. I’d be happy to share some of my experience with promoting in the equestrian realm if you like. I am new to your blog and this was a great introduction for a new reader. 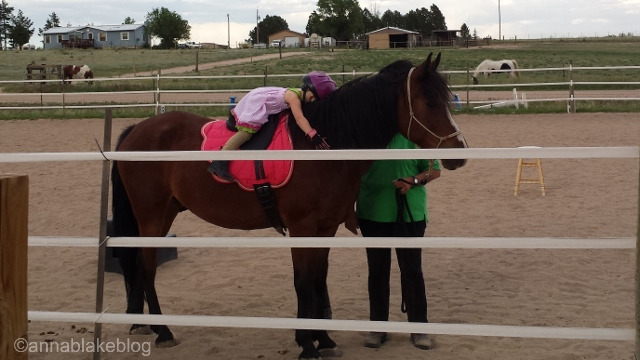 Enjoyed reading about your success with the blog and a heart-warming story for a horse lover. Thank you, and welcome to our herd! Anna, I have read and enjoyed your blog and weekly photos very much, and include some of your posts in my weekly newsletter (a very small distribution, but as you say it starts somewhere!) I will definitely read your book. Embarking on writing this book at my ags lets me know that there are still a world of adventures out there. Happy New Year to you and yours. The link didn’t work for me from feedly. I went to the website and finally found the link at the top. Thanks, I will take it apart tonight and try again. Sorry! Like almost everyone, I don’t always read everything because I get busy and this old gray mare can’t even keep track of all the passwords and logins I’ve agreed to some of the time. I thought it was extremely clever of me to “follow” you once I found you because otherwise I might never have found you again but I know i have failed to “like” and comment as often as I have felt a positive reaction to what you’ve written. So far I have ALWAYS liked what you’ve written – and even HOW you’ve written it. I think you have an uncanny way with words and, obviously, with animals and humans. I will try to click wherever to support you and I hope to be able to buy the book (books I still understand well, thank goodness!) Now that I’ve typed all this, I hope I manage to convey it to you. Thank YOU! I hadn’t made any resolutions yet but reading you more consistently has just become one. Best wishes from the windy (and currently snowy, much to our surprise!) high plains of southern NM. Keep up the good work. Thanks, Cat. I think I do remember a response or two from you… and you are welcome. I am in the same boat. I follow, my time is tight, and things fall through the cracks. The world is a very big, complicated place, even if you live on the plains like we do. Thank you for not letting me get lost in the shuffle. And that is my hope for the book, that somehow it floats near the top of the ocean of published books for a little while. Stay warm, we are sending more snow your way today. Hannah gets credit for that, she is the truest light. I just listen. Thanks for reading. I love you words, your shared traning tips, Grandfather Horse, Edgar, the Corgis…shall I go on? You speak to me. I can’t wait to read your book. Looking forward…. At the risk of sounding dorky, this process is kind of daunting. All your kind words have really set my resolve. I keep saying it over and over, but I mean it. Thank you. You havs an amazing way with words,I always read your blogs they are very inspiring, as I think your book will be. Thanks and I hope you’re right! The fix to the link is that it is missing the colon after the https. If you put that in there, it goes to the link correctly. Very excited for you! Good luck on this next step!! Good writers give their readers riches beyond price. You are one of those good writers, so it is great news that your first book (I believe that there will be many more) will be available to your devoted readers. I wait with a big smile on my face.